After many years of being intrigued by personality types, and Myers-Briggs in particular, I am finally reading Isabel Briggs Myers’ book, Gifts Differing. I wish I’d read it sooner — aspects of the theory that it took me years to learn about through casual reading are all explained in chapter 1. I wish I’d stumbled across an article talking about what all those letters actually mean earlier, or that I’d thought to read the book. Since the best way to really learn something is to teach it, and in order to write the article I wish I’d read years ago, here is my own version of an introduction to the Myers-Briggs Type Indicator (MBTI). 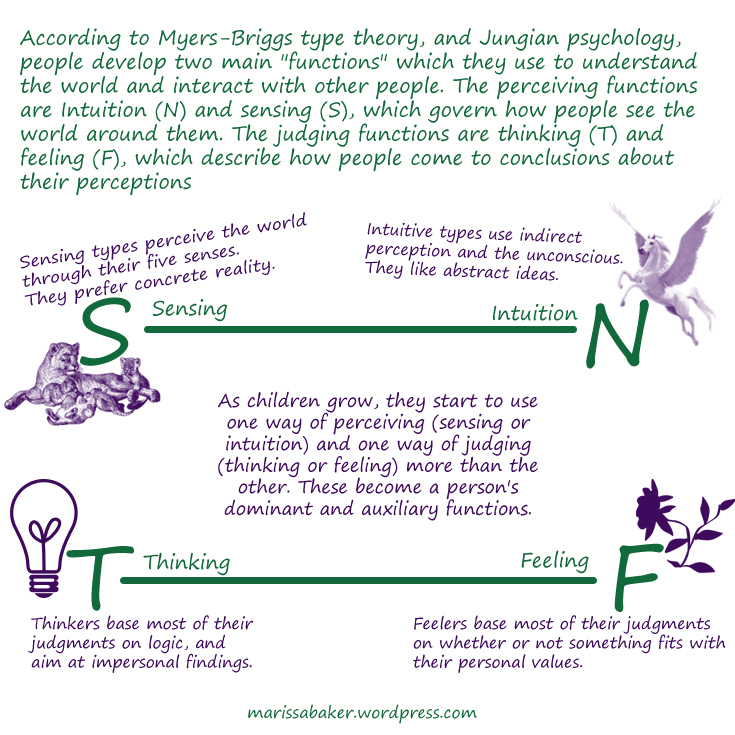 Myers-Briggs typology, and Jungian psychology, say that people have two main psychological “functions” which they develop and use to understand the world and interact with other people. The perceiving function includes “the process of becoming aware of things, people, occurrences, and ideas.” Intuition (N) and sensing (S) are two different ways of perceiving. The judging function “includes the process of coming to conclusions about what has been perceived.” Thinking (T) and feeling (F) are two different ways of judging. As children grow, they start to use one way of perceiving (sensing or intuition) and one way of judging (thinking or feeling) more than the other. They become comfortable with the preferred perceiving and judging functions, and learn to use them much more effectively than the neglected function. This results in four possible combinations: sensing plus thinking (ST), sensing plus feeling (SF), intuition plus feeling (NF), and intuition plus thinking (NT). Isabel Myers says that in Jungian psychology, introversion (I) and extroversion (E) refers to whether people orient their lives around the inner world of concepts and ideas or the outer world of people and things. Every healthy person uses both introversion and extroversion, but there will be one with which they are most comfortable. This relates to the Sensing-Intuition and Thinking-Feeling functions by dictating whether a person’s dominant function is introverted or extroverted (more on that in a moment). 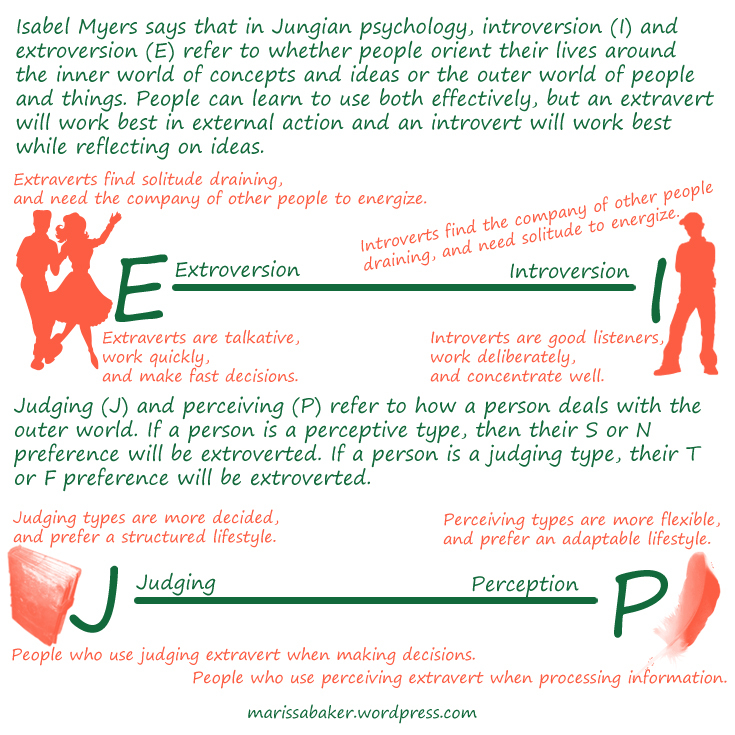 The last letter in a Myers-Briggs type refers to whether a person uses a perceptive (P) or a judging (J) “attitude as a way of life, a method of dealing with the world around us.” People use both a perceiving and a judging function; one extroverted and one introverted. If a person is a perceptive type, then their perceiving preference (S or N) will be extroverted. If a person is a judging type, their judging preference (T or F) will be extroverted. Since the Judging-Perceiving preference only refers to outer behavior, it most easily observed in Extraverts. For example, an ENFJ will extrovert their judging function and use extroverted feeling (Fe) to interact with the outer world. Because they are an extrovert, this also makes Fe their dominant function. It is supported by an auxiliary perceiving function: introverted intuition (Ni). Dominant and auxiliary functions are a bit more complicated for introverts. An ISTP type will extrovert their perceiving function and use extroverted sensing (Se). However, since they are an introverted type, their dominant function is introverted thinking (Ti) and Se is their auxiliary function . The function they use the most is a judging one, but when they interact with the outer world they use perception. It is far too simplistic to take each individual letter in a Myers-Briggs type separately. To say an INFJ is an introvert/intuitive/feeler/judger misses what the MBTI can tell us about how they look at the world with Ni and how they formulate judgements with Fe, and which of those they do most easily. It also passes over the fact that introverts sometimes use extroversion and that extraverts sometimes use introversion. That’s why the short Myers-Briggs style tests you might find online that line-up descriptions of Extravert-Introvert, Sensing-Intuition, Thinking-Feeling, and Judging-Perceiving and then have people choose which one is most “like them” can be an incorrect assessment of a person’s type. One other thing to add about Myers-Briggs types is that Isabel Briggs Myers never intended for these types to be used to make people feel “boxed in” to their personality type or to infringe on a person’s right to self-determination. An ENTP, for example has “already exercised this right by preferring E and N and T and P.” Myers-Briggs type is a tool for better understanding who we have already chosen to be, and for learning to relate to and better understand people who think differently than us.